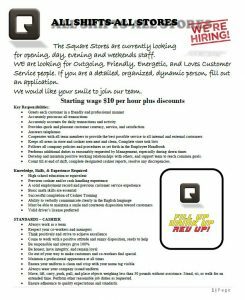 Q Square Stores actively hire and serve the community, our employees are always encouraged to strive to be a part of our management team. Q Squares promotes supports employees aspirations and career tracks within the organization. Life at Q Square stores is a high paced fun environment. Candidates must be available to work weekends and holidays as needed. General duties include providing excellent customer service, completing sales transactions, cleaning, stocking merchandise, and receiving deliveries. Qualified applicants will be friendly and outgoing, with excellent communication skills. We are looking for people who are high energy and dependable, with an ability to multi-task effectively. Candidates must be able to stand for long periods of time and lift up to 30 pounds. If you are looking for flexible hours, a positive work life, and the opportunity to advance within our organization- please fill out our application and deliver in person. When we are hiring, we invite you to submit your application. Please download the job application here, complete and submit in person to the appropriate store location. Here is what we need. Click to learn more.